Besøg fire af Kairos stjernede attraktioner og udforske Old Cairo på denne helgedagstur, herunder frokost, med en egyptologguide. Besøg egyptiske museum for at se Tutankhamuns begravelsesmaske og mere; og se Mosque of Mohamed Ali, ellers kaldet Alabaster Mosque. Dyk ind i Old Cairos gamle baner for at se den berømte hængende kirke, andre koptiske kirker og synagogen i Ben Ezra. 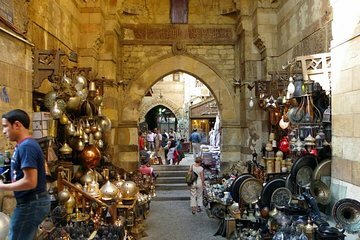 Afslut på Khan el-Khalili-basaren, Kairos gamle souk, med fritid til at udforske de smalle gader og shoppe til kunsthåndværk, smykker og pyntegenstande. We had an amazing time on our guide Khaled. He was very well versed in Egyptian history and attentive to our needs on the tour. The Hanging church, perfume shop, and Egyptian Museum were some of my favorite places I've visited in Cairo. Lunch was tasty and the selection was wide. Khaled was very good at keeping us from getting overwhelmed by vendors in the bazaar and helping us haggle for a good price. I would tour with them again in a heartbeat. Amazing, fascinating, and entirely enjoyable. Our guide Mahmood Ahmed was excellent, knowledgeable, and very cultured. He took his time out to explain the various facets and facts of each individual site - its history, culture, and people and ho they built these beautiful architectures. The time for the tour was ample and we had a great shopping experience at the Khan market. All in all I would recommend this trip and Mahmood Ahmed as the guide for anyone visiting Egypt. The Egyptian Museum deserves a full day but with limited time... our guide gave us 3 hours of the highlights. You have to pay extra for the King Tut Treasure Room well worth it and Mummy Room depends on your interest. The Mosque and Hanging Church were Holy Family hid were great. You can skip the Bazaar for more time at the Museum. Manar Atwa was fabulous! She was knowledgeable about all the sites and the customer service was incredible. She assisted me in purchasing items by informing me of a good price and took me to locations to obtain the items. The tour was great and I highly recommend it to everyone! Our first time in Egypt and it was a trip to remember, my husband and I celebrated our 5th year wedding anniversary in Cairo and we had a great time. Our guide Michael Yehia was so great I was super impress by his wealth of knowledge on the history of Egypt and the site we visited, the Egyptian Museum, Alabaster Mosque, Hanging Church, and Khan Bazaar. Learning about the Coptic Church where the holy family live was unbelievable, the Alabaster Mosque was a great site to see and shopping in the Khan Bazaar was a wonderful experience. Michael took great care of us, that day I was having a belly ache, Michael went out of his way, and consulted with a doctor, and got me exactly what I need to relives the pain. Also drinking from the well worked...lol. Thank you Michael for a great day in Cairo. I hope one day you achieve your dreams by teaching. The tour guide was not speaking in a culturally appropriate manner. The tour itself is overcharged compared to the service provided, even taking into account that the entrance fees and lunch was included. The buffet lunch was not in a great restaurant or location. We also felt very rushed and didn't have time to go through the areas we wanted. I would not recommend this tour.